A few weeks ago I tried to help my six-year old son to see that Jesus is the real Santa; the only one who surprises us with good gifts, of which the most important one was the gift of His own life. When I told Matthew that all the gifts he is so eagerly waiting to receive from Santa this Christmas, and the list is not a short one, are actually coming from Jesus (one way or another), he responded with a disappointing “Noooooo! 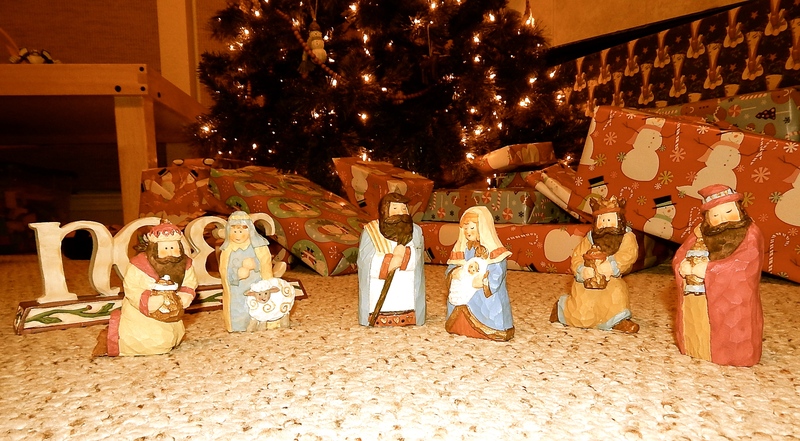 Jesus does not bring presents!” When it comes to Christmas in his childish innocence my son still prefers Santa to Jesus. So do millions of grownup Americans, but not for so innocent reasons. In a culture that is increasingly becoming annoyed with Jesus too many still prefer a life of denial. Take time to observe the ways Christmas is featured in media, advertising, entertainment, shopping malls, classrooms? Most of it is about commercially designed ‘joy of giving’, and wishy-washy spirituality, with little or no room for Jesus. The actor Reverend Billy, about whose “Church of Stop Shopping” and “Shopocalypse” many Christians have mixed feelings, speaks a more sobering truth about contemporary Christmas, drained by the spirit of commercialism, than many church circles would dare speak. Nowadays Jesus is missing out of Christmas in more than one way. He is taken out by intensifying process of secularization and atheization of society, and through various gimmicks that advocate political and social correctness. The popular culture still wants to keep the warmth and joy of Christmas, but is increasingly offended by Christ in its center. Consequently the elves, artificial snowflakes, plastic Santas, Christmas parades, Christmas music à la “Santa Baby”, and other cheep holiday décor are multiplying, while the Baby Jesus, the manger, shepherds and Wise Men of the East are taken away from the story. I went the other day to a shop well supplied with the outdoor Christmas decorations looking for a nativity scene that would feet my outdoor Christmas lights decorations, and could not find any. At the end of the day we are left only with the non-offensive “holiday trees”, and holy jolly well wishes, such as “Happy Holidays” or “Season’s Greetings”. More concerning ways Christmas is ambushed come from within, however. The prevailing Christian faith culture of today, that only superficially knows its Lord, is not able to create a meaningful Christmas environment that reaches beyond the spiritual illiteracy. Christians that are not taught any more the Biblical meaning of Advent, Incarnation, Redemption, Atonement and Salvation in Jesus Christ cannot go much beyond a purely cosmetic or fictional Christmas. Researches of religion George Gallup and Jim Castelli stated: “Americans revere the Bible – but, by and large, they don’t read it. And because they don’t read it, they have become a nation of biblical illiterates.” Barna Group, a Christian research organization, summarizes the state of spiritual fitness of American Christians: “Increasingly, America is biblically illiterate.” It is hard to bring Christ meaningfully back to Christmas in the climate of overwhelming spiritual impoverishment. Jesus does not need Christmas. He could do without the tradition that He did not introduce anyway. However, Christmas with Jesus in its center is one of the most beautiful experiences, and a powerful tool to teach children about the gift of Jesus to human race. Why not start teaching children from their earliest age that the real attraction of Christmas is Jesus and not Santa? Let’s make each toy, each present our kids are receiving this Christmas, tell a story pointing to the greatest gift of all, the gift of Christ. There is nothing wrong with celebrating Christmas, well-decorated Christmas trees, illuminated houses, sharing gifts with family and friends. But let the experience of Christmas be firmly rooted in remembering, reliving and retelling the story of Jesus’ birth in the context of His entire redemptive ministry. It started many years before the Virgin Mary gave birth to Jesus in Bethlehem. Baby Jesus of Christmas was “God with us” announced at the dawn of human history, repeatedly promised by the prophets of the Old Testament, incarnated through the virgin birth, died for our sins, was raised from the dead for our salvation, glorified at His ascension, and He is about to come back for the second time as the invincible King of kings. When observed in its complete redemptive context the birth of Jesus becomes much more than a sweet fairytale, or an excuse for the white elephant game. One way of combating the culture of spiritual illiteracy today is for the community of Jesus’ followers to restore Christ into the center of the Christmas narrative. This entry was posted in Faith and tagged Advent, Atonement, Barna Group, Christmas, Christmas Tree, commercialism, gifts, Happy Christmas, Happy Holiday, Holiday Tree, Incarnation, Jesus Christ, Maranatha, Redemption, Reverend Billy, Salvation, Santa, Season's Greetings, Secularization. Bookmark the permalink.